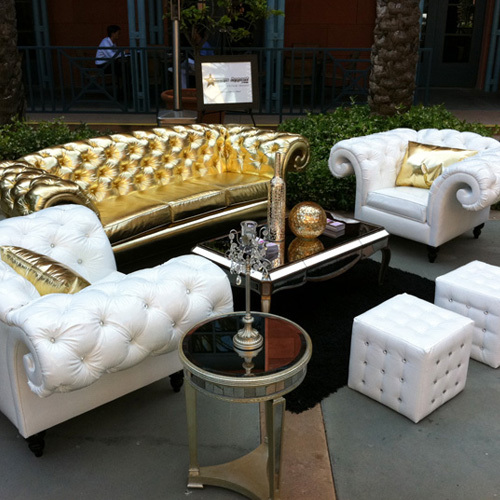 If you’re looking for great wedding lounge furniture ideas, you’re in the right place. Few events in life can match your wedding day for excitement and emotion. You’ve dreamed about it; now here you are bringing those dreams to life in every magical detail. Big wedding or small, indoor or outdoor, country-themed or urban, black tie or casual, the hopes and dreams are the same; you want your big day to be as special as it can be. And whatever pictures you’ve created in your mind, it’s time to furnish them for real. Here we’re going to help you bring your wedding lounge to life. Wedding lounges are the ‘in thing’ and for very good reason. Back in the day, guests milled around waiting for the wedding party to arrive at the reception. And if you and your entourage had ducked off to some exotic location for photos, that wait was a long one. 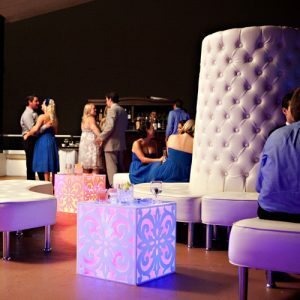 With a wedding lounge your guests have somewhere nice to relax and chat over a few drinks while they wait for the main event. Chances are, if your lounge is comfy and welcoming, they won’t even notice if you run late! It all comes down to space and how relaxed you want your guests to be without falling asleep! If you have to accommodate a large number of guests in a smallish area, simple chairs allow you to seat fairly compactly and create conversation pits. Don’t line all your chairs up along the walls like a dance hall or your guests will end up staring at walls. Wedding chairs and lounge chairs come in a weird and wonderful range of styles, from simple molded pool side chairs to the most regal thrones and armchairs. If space is at a premium, benches can offer a solid, less cluttered look than a scatter of chairs. Also, guests can sit on both sides and get to know one another. Don’t think bench seating is a bit basic; with the choices available today, it’s anything but. Yes, if your wedding has a country theme, you can go with a simple wooden bench. But from there your options are as wide as your smile when you say “I do.” Plush lobby benches and curved benches; round benches with padded backrests; corner benches, island benches; the list goes on, as does the selection of styles: contemporary to royally ornate. Please excuse the terrible pun, but it’s true. If you have the luxury of space, luxury is exactly where you can go with sofas and chaise lounges in every style and configuration imaginable. From simple and straight to curved and square sofas with seating all the way round, there are endless ways to seat your wedding lounge guests with flair. Plush leather fireside sofas, contemporary armless sofas; Tudor, Rococo, retro, there’s wedding lounge furniture to match every theme. Tables give your wedding lounge its functionality. Guests have somewhere to put drinks and you have somewhere to put snacks. Again, space is the big consideration in the ‘tables or no tables?’ debate. Fortunately the best wedding furniture suppliers will have already had this debate for you. As a result, there are table options for even the most confined areas. Coffee tables, end tables and cubes are ideal for seated guests. Of course, no matter what you do and no matter how much seating you provide, some people will stand anyway. They’ll chat in groups with glass in hand and they’ll be perfectly happy like that. You can, however, dot your wedding lounge with high tables for glass placement and hors d’oeuvres. No one wants it to rain on their wedding day. If it’s an indoor wedding, it doesn’t really matter if it does. However, if your ceremony and reception are at a beach, in a garden, or anywhere else the elements might become an element, tents and large umbrellas are a good idea. Often, these can be coordinated to suit your theme and color scheme. And a covered wedding lounge can give your wedding layout a spectacular lift. Say you have an ocean theme for your wedding and your lounge furniture needs to be in specific shades of blue. How do you go about finding the right styles of chairs and couches in exactly the right colors without Googling yourself into a frenzy? Well, there is an easy way; you’ll find it in Lounge Appeal ‘Collections.’ Here you can search for furniture by color – navy blue, royal blue or baby blue for our ocean theme example. The site will list all chairs, tables, bars, sofas, benches, ottomans and pillows available in that color. There are even tents, lighting and freestanding walls. Try mixing and matching a huge range of furniture by color. Have some fun and see just how far your favored colors can take you. A wedding lounge sets the tone for your reception. It’s a place for family and friends to stay in the spirit of your big day until the ceremonies begin in earnest. So have some fun with it. Go unashamedly retro or wildly western. Roll out a lavish black tie atmosphere with stately furniture fit for a palace. Or go sleek and modern for a more casual, contemporary wedding vibe. Chances are, if you can picture it, a great wedding lounge supplier can bring it to life and make the images you have dazzle even brighter. If you’d like more excellent tips for planning the perfect wedding, there are plenty of informative blogs out there. Here’s one that’s well worth a look and another that might provide some inspiration. If you’d like expert advice on creating real Lounge Appeal for your wedding, visit our contact page. Give us a few basic facts about your event and of our expert planners will be in touch.